In May of last year Roam Mobility announced that most of their SIMs would now feature a six month expiry date. Now, the company has had a change of heart, returning all their SIMs to a one-year expiry from the last time they were topped up. Several other features were announced alongside the new policy. Roam now lets users check how much data they have left by texting the word “balance” to 7850. You can also specify a time-zone when scheduling a plan, making it easier to make sure your plan starts at the time you hit the border, or land in the airport. If you are using a Snowbird plan and want to add another month, you can do so by logging into your account on Roam’s website, selecting your SIM, and then choosing the option to extend your plan by a month. For daily plans, users can follow the same procedure, but instead select ‘Reschedule’ to change the day that it’s meant to start on. If a group of people are travelling together and are on the same account want to top up their SIMs, there’s now an option on Roam’s website to top up multiple SIMs simultaneously. Roam also announced that two features are being removed from its service, one temporarily and the other permanently. Up until now you’ve been able to change your Roam Mobility phone number periodically. That feature has been suspended for the time being, as has the ability to activate a new SIM and transfer your existing Roam Mobility number to it. Roam indicated that this feature would return, but didn’t state when. In the past Roam has indicated that they hope to allow people to port in numbers from other U.S. carriers, so perhaps the suspension of this feature is part of implementing that. Finally, up until now it’s been possible to top up by texting in your request, or by phoning customer service. 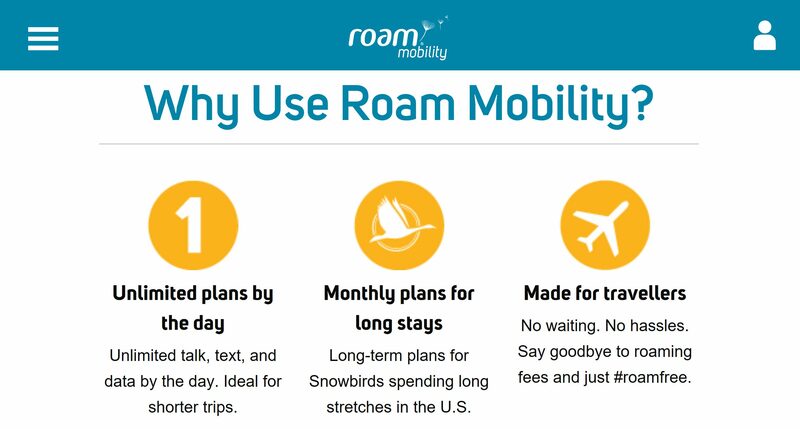 Touting enhancements to their website that make it easier to use on mobile devices, Roam now requires all customers to top up on roammobility.com.